Having had a little more time to experiment with the Archives Hub EAD data, and to think about what sort of operations on the RDF data we might wish to perform or enable others to perform, I’ve introduced a few small extensions to the model I described a couple a few weeks ago. At our last project meeting, we talked about some of the possibilities for visualisations of the data. One of the ideas (suggested by Jane) is to explore representing relative sizes of collections, perhaps on a map, so that, for example, a researcher could provide a geographic location and a subject area and get a visual representation of the relative sizes of collections within that area. 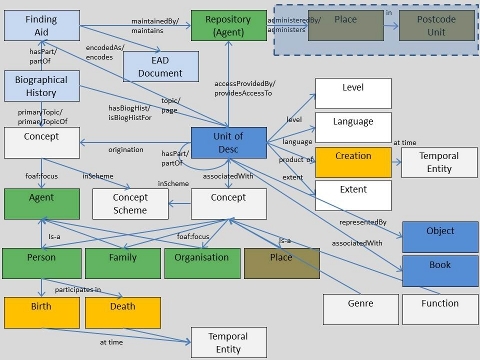 In the initial model, this was just treated in RDF as a single triple with subject the URI of the unit of description (an archival collection or some part of it) and this string a literal object. I’m suggesting changing this to treat the “extent” as a resource with its own URI, rather than simply as a literal. Doing that enables us – for at least some of these cases – to make explicit that it is a value measured in some “unit” (linear metres, archival boxes), to “normalise” the way those units are represented (so e.g. “linear metres”, “metres” and “m” can be mapped to a single form in the RDF data), and possibly to make comparisons, albeit approximate ones, between extents measured in different units (for example, “archival boxes” and “linear metres”). Having said that, I recognise that the nature of the input data is such that such techniques are usefully applicable only to a subset of the data; I’m not sure there’s a great deal we can do with “composite” strings like the last one in the list above, other than present them to a human reader. One of the other ideas for presenting data we’ve chewed around is that of some sort of “timeline” view. It’s something I’ve been quite keen to explore – though I’m conscious that the much of the most useful information is, in the EAD documents, in the form only of prose in the “biographical/administrative histories” provided for the originators of the archives. It’s possible to generate this just from simple processing of the input data. It may be possible to go further and generate a richer range of “events” through the use of some flavour of intelligent text analysis/”entity extraction” tools on the biographical/administrative history text, but that’s something for us to consider in the future. Finally – and as I noted in the previous post this is something which goes beyond the content of the EAD documents themselves – prompted mainly by the recent announcement by John Goodwin that the Ordnance Survey had extended their linked data dataset to include “post code units”, I’ve added in a notion of “Postcode Unit” so that we can make links to resources from that dataset (and also to the UK Postcodes dataset). So, I’m hoping that – bug fixes aside – I can stop tinkering with this for a while 🙂 and that we can work with this version of the model, and test out what is possible and where any “pain points” are, and then think about where further changes might be useful.